The program featured some of the nation’s top juvenile justice scholars and gave the audience a look back at the decision that established a right to counsel in juvenile delinquency cases, as well as a glimpse at current issues facing the juvenile justice system. In the state of Kentucky alone, approximately 3,500 young people were prosecuted in juvenile delinquency proceedings last year. About 50 of those were children under the age of 10. Yet, these kids are not committing the types of offenses most would assume. Most of the youth who are prosecuted, both in Kentucky and across the country, are charged with misdemeanor and status offenses. “We historically have allowed for kids to make mistakes, and to learn and grow from those mistakes. If those mistakes lead to involvement in the court system, however, they take on a magnitude far beyond what many might anticipate,” said Cortney Lollar, Assistant Professor of Law at UK Law. The conference was a unique opportunity to reach high school, college and law students, whereas most conferences hosted by law schools are geared toward law students and members of the legal profession, not young people in the community. 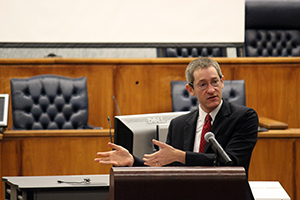 “We felt the 50th anniversary of the Supreme Court case establishing a right to counsel in juvenile cases was a great opening to bring high school students to the law school to learn about an area of the law that might hit a little closer to home,” said Prof. Lollar. It was the collaborative efforts of Prof. Lollar and Rebecca Ballard DiLoreto, Executive Director of the Institute for Compassion in Justice and Adjunct Professor of Law at UK Law, who made the event possible. DiLoreto, former public defender, served as moderator for the conference. In addition to panelists discussing the history of In re Gault and current issues in the juvenile justice system, students participated by posing questions throughout the program. Immediately following the panel discussion, members of StreetLaw, a UK Law student organization dedicated to teaching high school students and members of the Lexington community about law and the legal system, conducted a “Know Your Rights” training. A post-conference event entitled, “Designing a Youth Justice Advocacy Network and Celebrating In Re Gault, the Rights of Youth,” took place in the evening at the King Alumni Hall Ballroom. The purpose of the event was to educate youth about their legal rights and launch a Youth Justice Advocacy Network to support justice work in Fayette County. Sponsors for the event included: The Institute for Compassion in Justice, Lexington United, UK Embrace, The University of Kentucky Office of the Provost, The Food Connection, and the Fayette County Race, Community and Child Welfare/Disproportionate Minority Contact Committee. Those in attendance created a meal together, learned about the constitutional rights of youth in the justice system, and learned how youth can become engaged in advocacy work in Fayette County.